Approximately 48 million people in the U.S. get sick from a foodborne illness each year (Centers for Disease Control). Some that are more common include bacteria like Campylobacter, Escherichia coli (E. coli ), Listeria, and Salmonella. In the interest of preventing these episodes as opposed to simply reacting to contaminations as they occur, the Food Safety Modernization Act (FSMA) was implemented. As a result, food processors — not only in the United States, but around the globe — have transformed the way they are testing their products for foodborne pathogen contamination. Developing a prevention-based system is how you work to ensure your plant is operating within FSMA guidelines. This important data comes through the task of Sample Collection. The standard process is to first determine a product or an environment that you want to test for contamination, then to conduct a sampling process. Product sampling: the food product itself is tested directly. Environmental sampling: the processing environment is tested. This includes areas such as surfaces, equipment, drains, and much more. Emergency response sampling: a reaction to an outbreak to help determine the source of contamination. This is exactly the approach that FSMA implementation intended to stop, instead promoting a methodology of detection by way of prevention. It’s not worth risking the safety of customers and the reputation of your plant. A purposeful, well thought out strategy is central to the success of an effective food safety testing program. Timing: if you’re testing for a specific contamination like Listeria species, it’s important to know that the enrichment process will require 24-48 hours. Not waiting the proper amount of time for enrichment can result in an inaccurate result. Transportation and temperature: it’s common to ship samples from the food plan to the laboratory to be analyzed, and microbes are extremely fragile and should remain at refrigerated temperatures to maintain them viable. Create an operations plan for how often you will test, where you will test, and the supplies you will use for a given area. A good practice is to define in advance and establish an environmental sampling plan to meet Hazard Analysis & Critical Control Points (HACCP) prerequisites and to validate the process. Finally, following regulatory guidelines from the FDA and USDA should be followed to prevent food safety hazards. Food processors regularly clean the environment in which their products are produced, which of course is a good and necessary procedure. However, standard plant cleaning agents (sanitizers) can destroy microbes or harmful foodborne pathogens that you are looking for in the first place. If this happens, then the bacteria cannot be detected. To prevent sample destruction from happening, you must first choose a good neutralizer for the sanitizer that is used. Recommended neutralizers for food industry include Dey-Engley Neutralizing Broth (D/E), Neutralizing Buffer (NB), Buffered Peptone Water (BPW) and Letheen Broth (LB). It is critical to verify that the chosen neutralizer has an efficient action against the used sanitizers. 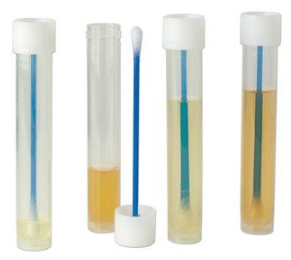 Neutralizers are most often added to a sponge or a swab to facilitate the neutralization of residues of cleaning agents and sanitizers that may be picked up during swabbing. An action to consider during a design of an environmental monitoring plan is keeping in mind how often manufacturers switch sanitizers, so that the bacteria do not become resistant. The FDA, USDA, and ISO provide recommendations on which neutralizers to use under different conditions, as part of your sample collection process. Quality sampling starts with selecting quality tools. A frequent myth within the topic of environmental monitoring and food safety sample collection is that a larger tool, used to test a larger sample surface area will increase the odds of successful detection. However, it has been shown that increasing the quantity of samples and individual testing zones, combined with selecting the right size sample tool for those areas is what provides the best chances for effective recovery. Small & defined surface areas: corners and rinsing areas in the lines themselves where the food is moving on the plant floor require swabs meant to help sample hard-to-reach areas for increased accuracy. The 3M™ Enviro Swabs and 3M™ Quick Swabs are considered for sampling small, defined surface areas. The 3M™ Swab-Samplers also feature a self-contained swab and vial to improve productivity and efficiency. Large & undefined surface areas: food contact surfaces, floors or work benches provides a limited possibility of picking up the sample that you are looking for when using a small swab. Instead, under this situation where a large surface area needs to be monitored, it is recommended to use 3M™ Hydrated-Sponge or 3M™ Sponge-Stick. They are designed specifically for microbial surface sampling and very easy-to-use. 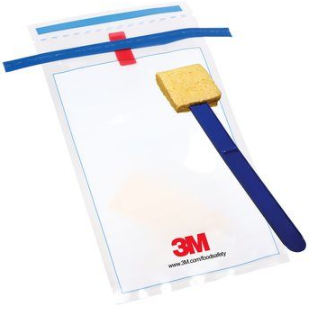 The 3M Sponge-Stick allows sampling without touching the sponge, increasing efficiency with less risk of contamination. The products listed above are hydrated with D/E Neutralizing Broth, which is recommended by the FDA and USDA for collecting samples from food contact and non-food contact surfaces in the food industry, and many products are designed for use in your meat processing facility or when testing poultry. 3M Sample Collection products provides you with the tools you need to safety collect and transport samples for testing. In the food processing industry, no plant is immune to contamination. Microorganisms are generally introduced into the food environment through raw materials, pests, air, water, and employees, and can survive in food processing and handling environments. Therefore, environmental and product sampling are important procedures to verify the sources of contamination and the adequacy of the sanitation process. Implementing an effective sample collection protocol in your plant can reduce errors, lower operational costs, and most importantly, provide the firm conviction that food products being manufactured are made under sanitary conditions.